This week I returned to the NW coast to take a look at the littoral zones (the areas of beach between the low and high tide marks) which I have come to know well over the past 18months researching this project . After a winter of repeated storms I had braced myself before walking out to a selection of remote beaches – Dun Canna, Rhue and Reiff . After 18 months researching into beach and marine litter I consider myself toughened to the issue but looking along the strandline of twisted rolls of seaweed I felt deeply disturbed and upset as I imagined myself walking into a Dali like landscape with bright blue and orange plastic sheeting draped over plastic piping and the giant knots of twisted ropes, buoys and domestic objects punctuating the strandline. 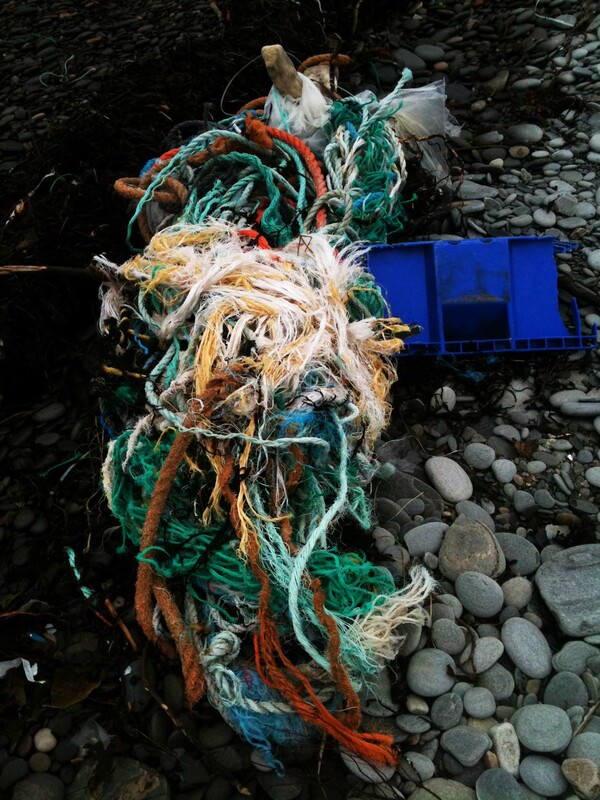 The knots of litter brought in by the wild weather and exceptional spring tides are bringing the issue clearly into view and are spurring me on to search out funding and to record my next Crowd Funding Appeal to take my project forward over the next two years. I am planning to produce an exhibition of work inspired by my research that will tour to five locations around Scotland over the next two years. My intention is to raise £3,000 over April to produce a ‘Guide to beach litter’ to accompany the show. Copies of the guide and beach litter key rings will be offered as rewards. If you have any ideas where and how I can promote the Littoral Art Exhibition appeal please do get in touch.